Pod people unite! This method of coffee making looks to be here to stay, as indicated by all the different brands and styles of coffee pods at my supermarket next to the regular coffee. 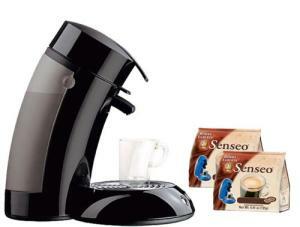 The Senseo machines were the first ones to be mass marketed in the US from what I have seen. And what an eye catching design to this coffeemaker. It looks to me like something straight out of a Dr. Seuss story. The concept was brought over from Italy, the home of the superfast shot of joe. It's a great idea, the pod. That is, if the most important thing to you is never having to touch the coffee grounds. For many of us, coffee is about freshness and flavor, and we will go to great lengths to satisfy that. A cup from a pod machine like this just cannot compete with the fresh ground stuff. Norelco made this pretty foolproof. Just fill the reservoir with water and insert a pod. Two pods for a larger/stronger cup. Place a cup under the nozzle and press the button. The unit stays on standby mode for an hour before shutting off automatically. With 1450 watts this takes no time at all to shoot hot coffee into your cup. All the parts are removable and dishwasher safe. This might be a good choice for someone who desires to cut down on their coffee consumption. If you or your household drink more than 2-3 small cups a day, I would not recommend this machine. The pods alone are the most expensive way to buy coffee on the market. However, if you enjoy having a variety of coffee flavors on hand at all times, this would be just the thing.